Captain Pappas was the Forward Air Observer attached to India Company, 3rd Battalion, 9th Marines on March 30, 1967. Our company had been split into three seperate units for the purpose of setting up night ambush positions. Captain Pappas was with our CP Group which also included the 2nd and 3rd Squads of the 2nd Platoon. The North Vietnamese Army (NVA) attacked our small unit on Hill 70 which became known as "Getlin's Corner" in honor of our CO Michael Getlin also KIA. I remember Captain Pappas calmly attempting to call in air support for our greatly outnumbered Marines. Enemy mortars, heavy machine guns and granades were all over us as Captain Pappas was mortally wounded. The Grunts had the utmost respect for our FAO because even though they were pilots, they were willing to spend months in the bush on the ground to provide us the very best air support possible. 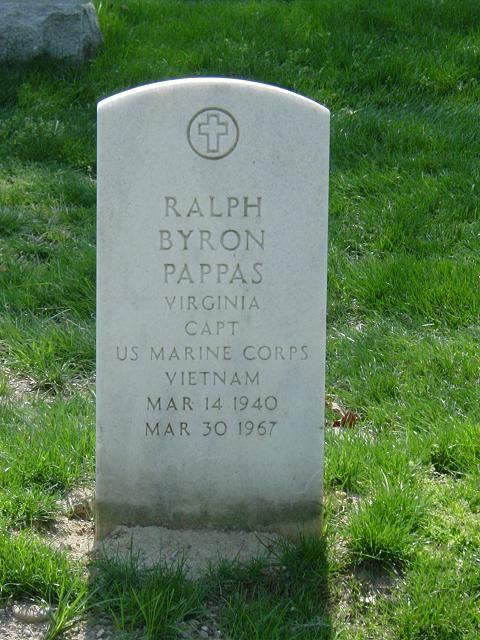 The Grunts of the "Flaming I" who survived Getlin's Corner will always remember our Marine brother Captain Ralph Byron Pappas.